How to Prepare Before the Round: Try to make the time before your tee-off stress free. Feel as if you do everything in slow motion without rushing or stress before an important round of golf. The great player Cary Middlecoff was known for a long, slow swing. His play was deliberate and he rarely cracked under pressure. He had a set routine like all great players and would never rush or vary his routine before a round. His routine included driving extra slow to the golf course and listening to relaxing music. Have a Set Warm Up Routine: Fitness research has shown that proper warm-up technique does not start with stretching. The correct technique is to warm up slowly before stretching. This could include a slow jog, but more realistically for the golfer, simply striking a few short shots with an easy swing. The best way is to make short 20- to 30-yard pitch shots, then slowly working into ¾ pitch shots. After a few minutes, begin stretching out the muscles, focusing on the major muscle groups for golf. Remember, never “bounce” when stretching, but hold the position for a few seconds and return to the relaxed position. Prepare for Your Opening Tee Shot: After going through your warm-up routine, mentally prepare for your opening tee shot. The last shot on the practice range when warming up should be the same shot as your opening tee shot. For example, if you plan on hitting a driver on the first hole, hit a good solid drive for your last practice shot. This way, there is a positive image in your mind. Practice Short Putts Before You Tee Off: Before you tee off, practice putts of one yard or less. Be prepared to hole out over 15 short putts during the round! Holing shorts putts can make or break your day. 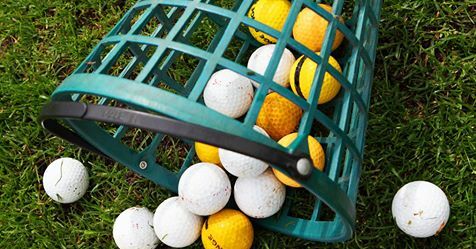 Choose the Correct side of the Tee Box: Don’t just plop the tee and ball anywhere between the markers. Remember that you have the right to tee the ball up anywhere between the markers and up to two club lengths behind the markers. The smart player uses this to his advantage. If a right-hander tends to fade the ball, he hits from the right side of the tee box; if he tends to hook the ball, he hits from the left side of the tee box. This can also help if there is trouble on one side of the fairway. Always tee the ball on the side of the tee box that has the trouble and shoot away from the danger. Tee the Ball High for a Hook and Low for a Fade: A ball teed high will tend to promote a sweeping swing, making it easier to draw the ball. Teeing the ball low will promote a steeper swing, promoting a fade. Use a Tee on Par Threes: When playing a par-3, too often I see a player simply drop the ball between the markers. Use a tee to your advantage by creating a perfect lie. A ball teed low just slightly above the ground level will mimic a perfect lie in the fairway. This will increase the chances of a solid strike. For Your Target, Have Tunnel Vision: As you prepare to hit a shot, choose a target and try to hit the ball only at that target. Many players immediately look for all the danger and spend more thought on what can go wrong rather than positive images. A good player has “tunnel vision” and simply aims at a single small target. The subconscious mind does not understand negative words; therefore, when you tell yourself, “Don’t go O.B.,” you are just telling your subconscious mind to “go O.B.,” therefore reinforcing negative images! Plan Your Strategy for Each Hole: Use the correct club to tee off. It is not necessary to hit driver on every hole. If you watch the pros, they hit driver as little as 3-4 times a round. A good strategy is to figure out what distance off the tee will give you a comfortable approach shot to the green. For example, a 345-yard par-4 may require as little as only 200 yards off the tee to leave a “comfortable” wedge shot. Often this strategy applies to par-5s, as well.